Your free wedding spend tracker. 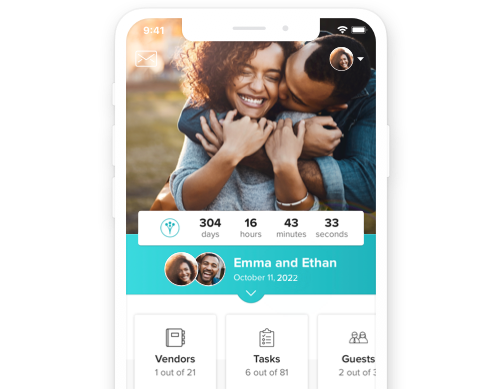 WeddingWire makes it easy to create and manage your budget. Don't worry about going over budget - customize the numbers, track your spending, and schedule payments. Enter your budget and we’ll estimate category costs for you. Track your spending as you go and manage vendor payments. Monitor your costs and view a breakdown of your wedding spend. Adjust your budget and create new categories as needed. The Budget tool on WeddingWire has been a huge help to me. I love that I can see what I've paid, what I have left to pay, and how much I have left in my budget. I live by the WeddingWire Budget and Checklist... I think I would have gone crazy by now without them. Must try the Budget tool! I've been able to see how much money I can contribute to each area and when I save and go under budget on one section, it allows me to redistribute to another section. The wedding budget is often the most stressful part of wedding planning, but not anymore! Keeping your wedding spending organized is key, so it’s best to start early. Whether you’re deciding how to distribute your budget or keeping track of wedding payments, our unique budget tracker organizes everything in one spot. You can only find this free tracker on WeddingWire, and our template makes planning your wedding budget easy. We’ll distribute amounts based on your total wedding budget, but you can customize numbers too. Setting the wedding budget can take some time, but once you nail it down, everything will fall into place. Having a specific wedding budget makes it easier to choose vendors, and it can also help determine how much to spend on your honeymoon. Once you’ve decided on the wedding budget, you’ll need to keep track of your wedding expenses and wedding payments. We make it simple to add your own categories and line items to the wedding budget. Want a photo booth? Need sparklers? Just add it to the wedding budget. We know it’s easy to forget the wedding payment deadlines with so much going on, so you can integrate your budget with your checklist to help take your stress level down a notch. Setting your wedding budget is just the beginning. Finding a venue, looking for wedding vendors, and creating a guest list should be next on your checklist. It’s best to have a wedding budget in place before you start — it will help narrow down your options and make the wedding planning process smoother.